Congress secured support of SP, BSP and four independents to cross majority mark of 116 seats in 230-member assembly of Madhya Pradesh. 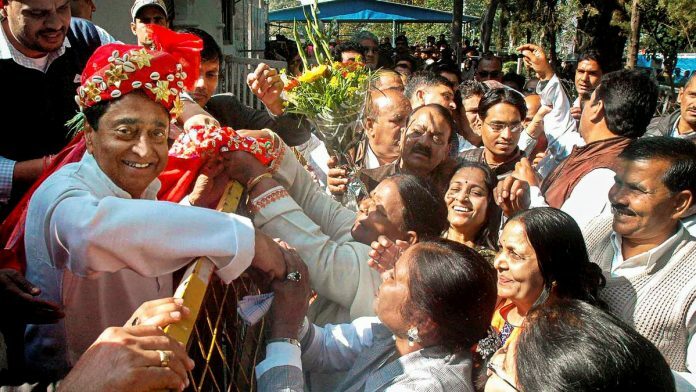 Bhopal: Congress leader Kamal Nath was sworn in as the 18th chief minister of Madhya Pradesh here Monday. Governor Anandiben Patel administered the oath of office to Nath, 72. The governor had on Friday invited Nath to form the new government in the state. The Congress on Thursday named Nath, the nine-time Lok Sabha member from Chhindwara, to head the state Congress Legislature Party, after hours of hectic parleys held by party chief Rahul Gandhi with senior party leaders. Nath, who has held several portfolios in the Union cabinet, was appointed the Madhya Pradesh Congress Committee president on April 26 and was at the forefront in steering the party to a win in the November 28 Assembly polls. The Congress, which won 114 seats, has secured support of 121 MLAs, including SP (1) and BSP (2) legislators and four independents, to cross the majority mark of 116 seats in the 230-member Assembly. The BJP, which ruled the state for 15 years, got 109 seats in the elections. The saffron party’s Shivraj Singh Chouhan was the state’s longest serving chief minister since taking charge in 2005. Those present at the swearing in ceremony included Rahul Gandhi, former prime minister Manmohan Singh, AICC general secretary Mallikarjun Kharge, Rajasthan Chief Minister Ashok Gehlot, his deputy Sachin Pilot, MPs Jyotiraditya Scindia, former Karnataka chief minister Siddaramaiah and Punjab minister Navjot Singh Sidhu. NCP chief Sharad Pawar, National Conference president Farooq Abdullah, Andhra Pradesh Chief Minister Chandrababu Naidu, Loktantrik Janata Dal leader Sharad Yadav, DMK’s MK Stalin, RJD leader Tejashwi Yadav and Kamal Nath’s predecessor and BJP leader Shivraj Singh Chouhan were also present.